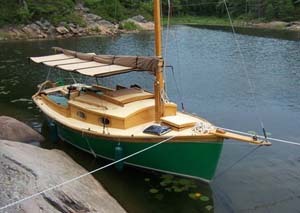 MIST is a traditional pocket cruiser built in plywood and epoxy materials. She has accomodations for two adults and two children. A vee berth forward and large quarter berth is provided to port. She is stable and has a self-bailing cockpit making her an able boat for her size. She has a well proportioned gaff rig to go with her traditional appearance that is easy to set up from a trailer. Build her and enjoy many hours on the water. Glue and screw construction is 1/2" plywood and epoxy over straight frames. 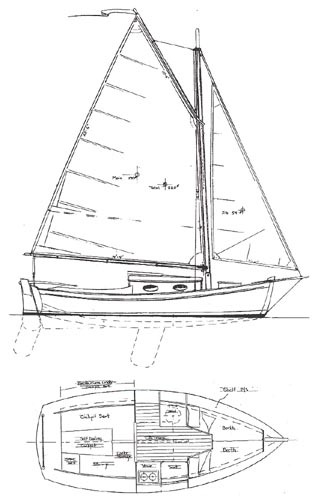 Plans include: materials, line, construction, and sail plan. A full size frame plan in available. Estimated cost for quality construction materials (not including power or sails) is $10000. This cost includes a high level of outfit and finish you can be proud of after putting the effort into building this fine boat. Purchase and Download Study Plans for the MIST for $5.00 in PDF format (zipped file). Purchase Construction Plans for the MIST for $110.00 for delivery by US Postal Service. Purchase Full Size Frame Lofting for the MIST for $110.00 for delivery by US Postal Service.